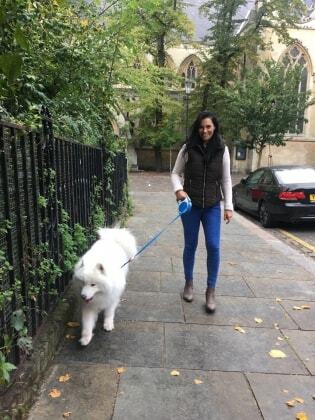 Dog friendly Notting Hill home with garden. We've both grown up with dogs in our family home and welcome all dogs as guests in our house. We will both be puppy-sitting the dogs, so they will not be short of any attention they need. Pups can sleep inside or outside depending on your personal requests. More than happy for pups to sit on the sofa too. Our house has plenty of parks nearby which are dog friendly and our house has a yard for inside and outside access for the dogs. If need be, we’ll cook for the pups if that’s what you prefer. Young pups are more than welcome and we are more than happy to help with training if need be. We have both attended Puppy training school over many years. More than happy for you to view the property and meet us, prior to any dog-sitting appointments. Kelso loves Natasha and Dave so much that when we picked him up, he refused to leave them. It shows how much our puppy enjoyed being looked after by Natasha and Dave! Can also offer puppy training.